2019 International Neural Tube Defects Conference information is live! Thank you to everyone who attended this year's 10th anniversary International Conference on Neural Tube Defects. It was a huge success, thanks to all of you! And a special thanks to our conference organizers: Drs. Richard Finnell, Laura Mitchell, Philip Lupo, and John Wallingford. The Marcy Speer award is given out at each meeting of the International Neural Tube Defect Conference to the pre-and post-doctoral trainees whose presentation was ranked the best by a panel of distinguished scholars. The competition is always intense, as all of the participants bring their finest work to the meeting. This year there was a tie for the best presentation by a pre-doctoral student. Ms. Amanda Baumholtz from Dr. Aimee Ryan’s laboratory at McGill University in Montreal and Ms. Micah Ross of Brigham Young University Provo, Utah ran away with the award. Amanda’s work on Claudins and neural tube defects is about complete and she will be on the postdoctoral job market soon! Ms. Ross works on redox potentials in embryos challenged by developmental toxicants. Amanda and Micah have both attended the conference before. 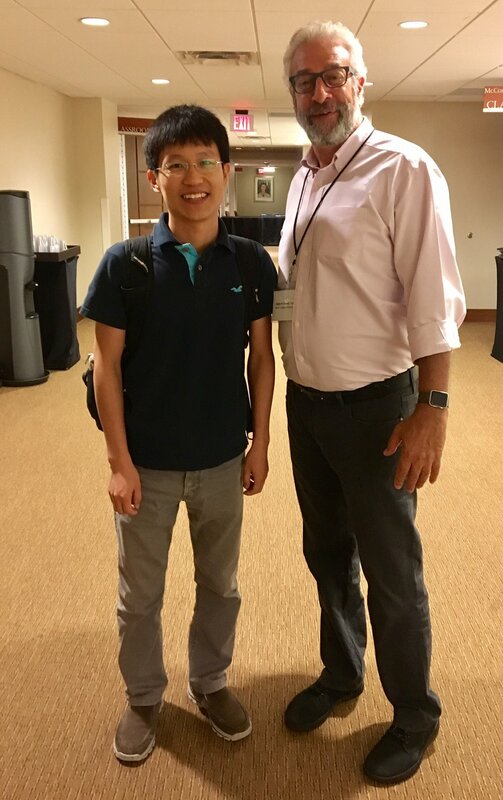 A first-time attendee who impressed the judges enough to win the Speer Award for postdoctoral trainees was Dr. Jitao Zhang of the University of Maryland. His presentation on measuring stiffness in embryonic tissues microscopically was extremely impressive! Force matters in closing the neural tube. Congratulations to Jitao, Amanda and Micah, and really, to all of the trainees. The efforts they put forth give us great hope that the future looks bright for the NTD research community. We are grateful to the following for their generous sponsorship of the 10th International Conference on Neural Tube Defects. **Funding for this conference was made possible (in part) by NIH grant R13HD093414 (NIH Institutes: NICHD, NINDS and NIEHS). The views expressed in written conference materials or publications and by speakers and moderators do not necessarily reflect the official policies of the NIH; nor does mention by trade names, commercial practices, or organizations imply endorsement by the U.S. Government. The agenda has been finalized!! Please click here to view it. If you are presenting a poster, the poster board stands are 4’ X 8’. NEW THIS YEAR: NEED A ROOMMATE?? If you want to keep hotel costs down, we now have a form you can fill out to find a conference roommate. Please see the link below. The sooner you add yourself to this roommate list, the sooner you can find one!! Don’t delay. ** If you registered yourself for a roommate, click this link to find a match!! Check back often as more people register themselves for a roommate, the list will update itself. Please do not include images, graphics, or references as part of your submission. They will be deleted from the abstract booklet. Abstracts must be emailed as a WORD document to jgilmore@austin.utexas.edu by Saturday, August 12th. Click here to register. If you are a postdoctoral fellow or PhD candidate, please complete the trainee registration - $325*. Otherwise, regular registration is $450*. The AT&T Executive Education and Conference Center is the host hotel for the International Conference on Neural Tube Defects. The room rate is $189/night, plus applicable taxes and fees. If you want to enjoy everything our city has to offer before the conference begins, we've arranged for a limited number of rooms to be available for check in starting as early as Friday, September 29. We hope to see you here in Austin in October! * Please note the increase in registration rates are to accommodate the rising costs of hosting this conference, and decreased funding from supporters. We appreciate your understanding. Registration will be open soon for the 2017 NTD conference. Thank you for your patience as we work on the final details for this year's NTD conference. Abstracts will be accepted starting June 1, 2017. More information to come soon. Eunice Kennedy Shriver National Institute of Child Health and Human Development (NICHD). Posters can be designed in Powerpoint: In Page Setup, set the size you would like your poster to be. For example, 42" x 60" or 36" x 54". Typical font size for the poster title at this scale would be around 90, with poster text around 24. Posters can also be designed in Adobe Illustrator: Set the poster up (when you create the document) to scale (36 or 42 inches tall by less than 60 inches long). Abstract submission is now open for the 9th International Conference on Neural Tube Defects to be held in Austin, Texas, October 26-29, 2015. Abstracts must be emailed as a WORD document to ntd2015@utlists.utexas.edu by Sunday, August 30th. Submission Guidelines can be found under the NTD 2015 tab. Complete the online registration form and then proceed to payments. The link will pop up after registration has been completed to navigate to the online store that accepts credit cards. If a different payment method is selected, a conference organizer will follow-up with instructions via email. Here is the link as well: TxShop. When completing the form, indicate a quantity of 1 in the first box and then add the number of participants in the categories below. Registration fees can be paid for multiple participants, but ensure that a registration form is completed for each individual participant. Questions? Send an email to satterbe@austin.utexas.edu. The first day of the NTD conference will start at 5 pm - 7 pm on 10/26/15. Click here for Hotel Reservations. The reservation code is NTDCON1015. September 28, 2015 is the cut-off date. If you prefer the option of phone reservations, please use the following dedicated Group Reservations phone numbers in order to make sure to access special block rates and you book within the block. The dates have been confirmed for the 9th Annual Conference on Neural Tube Defects. The 2015 conference will be held October 26-29 in Austin, Texas.